In the 55 years between 1940 and 1995, the record for the largest passenger ship changed hands twice. In the 24 years since 1995 that record has been broken 11 times. With additional size comes additional complexity, and it’s no different for the design process. The Global class. Made by MV Werften. MV Werften has developed a new approach to streamlining their concept and basic design using NAPA Steel. Through NAPA Steel, one central model is created that becomes the common basis for the steel and strength design. 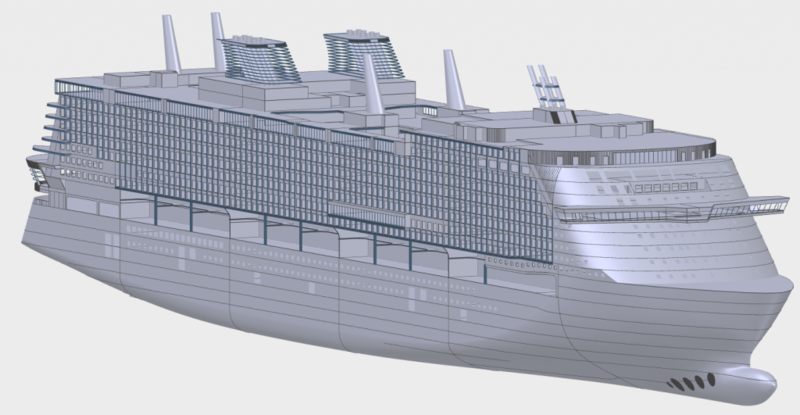 This also links directly to the shipyard’s product data model, general arrangement plan, and serves as a baseline for evaluating and assessing the viability of interiors, outfitting, and machinery. By combining these integral functions together, all those disparate disciplines’ models stay aligned with one another. This leads directly to improved data integrity and consistency, and lowered error rates in design. To find out more about this development, please join us at the NAPA User Meeting from the 4th – 6th June 2019 in Helsinki, Finland. Michael Zimmermann, Head of Calculation Services at MV Werften, will be presenting his full paper on this topic and exploring how he’s achieved a higher design speed using NAPA Steel, as well as how he’s been able to reduce reaction times when design changes are required.